The new year isn't that far away. It's always a good time for change in many areas of your life, from work to family. If you love your garden, it's an excellent time to start thinking about any change you want to make to it. Perhaps you think it's already perfect, but chances are you want to do something with it. You might not be able to do everything that you want to in the winter. But you can think ahead to spring and decide how you're going to use your garden for the rest of the year. One of the things you could do is consider planting something new for the new year. Even in the cold weather, you can get plants that will survive the winter and even look great while doing it. However, planting can be difficult when the ground is hard. You could think about putting out some pots and planters instead, then planting properly when it's a bit warmer. And you can think about what to do in the spring and summer when it will be a bit easier to do what you want. When you're thinking about what to plant, consider how they will behave over the whole year. Sitting outside is a great way to enjoy your home, and you don't have to save it for the summer. With an outdoor heater or perhaps a fire pit, you can keep everyone warm. Take some blankets and cushions out too and you can make sure everyone is comfortable. You can set up a seating an area in your backyard, whether it's on a patio or deck, or perhaps straight on the grass. Try looking at parasols to give you shelter from the sun, or perhaps the wind and rain. You can also get heaters that attach to them so that you can use them all year. It's great watching birds come into your garden and seeing who visits in the different seasons. If you don't already have a bird table or anything else up, it's a fantastic thing to add in the new year. You can get a table so that you can spread out some seeds and perhaps some leftovers from your kitchen. 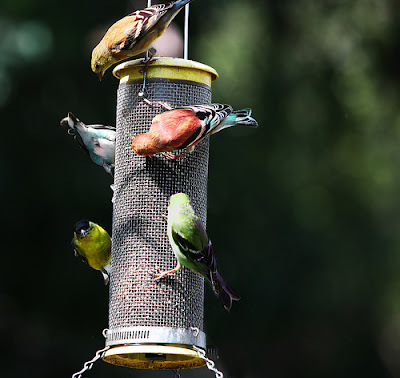 Or you can buy bird feeders that you can hang up from trees or walls. You can even make your own bird feeders, including fat balls made from nuts and seeds. A bird bath can also look good and give your winged visitors somewhere to drink from. Watching the kids run around in the garden is always delightful, but they can sometimes get bored outside. You can make sure they have plenty to do by giving them their own areas to play in. You could set up a Wendy house or a jungle gym, or you could put out stations for them to play with water or sand. Use the new year as an opportunity to make changes in all areas of your life. Don't neglect your garden when it's time to update other things.